Based on the supplies I have on hand, here were my options for wreath making and how I made them. Maybe you'll find something helpful, or they may spark an idea for you. The first material that came to mind was the grapevine material that I used to make the rose tree for the arbor. I have plenty left, but the problem is that it was too stiff and brittle to bend into a small enough circle. So, I boiled about 4 cups of water in a Pyrex measuring cup in the microwave and let the grapevine steep for about an hour. That made them cooperative, and all I had to do then was to cut a few lengths, shape them into circles, then hold them in place with floral wire. I had these heart shaped wreathes in my supply drawer. I'm not sure where I picked them up, but they're probably easy to find. Or, using the boiling water method, you could easily make your own. It just looks like they're folded in half, then held together in the middle. What looks like skinny brown twig wrapping them is actually rusty floral wire. For a super simple wreath, I just slathered one of the heart shaped wreaths with Quick Grab Tacky Glue, then added foliage from some Bill Lankford Creeping Phlox that I've had floating around in my landscaping drawer for years. I cut a piece, stuck it to the wreath, let it dry, then gave it a trim to shape it. It needed a bow, so I thought I would share how to make an easy bow making jig and bows. You'll need a pretty stout corsage pin. Mine is about 2" long and I'd say about 26 gauge. Then you'll need an earring back with the circular plastic thingy attached. And finally, a regular earring back. You'll also need some silk ribbon. I used 1/16" and 1/8" wide ribbon. This is how to set up your jig. The earring back with the circular plastic thingy is the work platform, and the regular earring back is just a cap for the end of the pin so you won't poke yourself getting it out of storage. To make a simple bow, leave a little tail on the end and slide a ribbon, centered, onto the pin. Slide it down to the earring back work platform. About 1/4" seems to be a good working distance to have the earring back from the end of the pin. Now make a loop as long as you'd like from the long end of the ribbon. Just before you slide it all the way to the work platform, apply a dot of clear drying glue to either side of the pin. Then seat the ribbons together and let set up for a minute. I use the Quick Dry Tacky glue because it grabs quick, doesn't stain the ribbon, holds well and dries clear. Now make an equally sized second loop. If you get it too large or small, just remove it from the pin and try again. You'll get the hang of it quick enough! Before you slide it all the way down, add the glue again. Let this set up on the jig to dry. To remove it, carefully put your tweezers between the earring back work platform and the ribbon and gently slide off. Then just cut the ends to your desired length. Cutting them at an angle looks nice. Bow making made easy! But wait! If you want to make a bow for a gift box, just keep doing this process until you feel like you have enough loops. The Christmas bows below have 24 loops and are made with self sticking ribbon. There are a lot of ways to attach the bows to the wreaths. For this one, I added a floral wire to the center, twisted, then twisted it onto the wreath. For the next front door candidate, I thought using some of the leftover Camellia flowers would be nice. To give some additional greenery as a base, I added some reindeer moss to about 60% of the wreath. Then added a bow. I inserted a corsage pin through the center where the two loops met, threaded that through to the back of the wreath, then bent the rest to make a hanger. A dot of glue under the bow and where the pin comes out of the back will hold it nicely. For a super cheap and easy wreath, I cut a few circle shapes from styrofoam, then cut out a hole in the center, then sliced in half to make it a better thickness. I coated all sides with Tacky Glue to give it some support and stability, let dry, then painted all sides in green. For the base. you can coat it in reindeer moss, or any fine miscellaneous ground cover in the color of your choice. I had several different kinds of "Garden Growies", so that's what I used. I coated all surfaces in tacky glue, then dropped them into a small container with the ground cover to coat. Once thoroughly dry, remove any loose material and trim with scissors to shape. This makes a fine backdrop to add flowers, beads, bows, birds, letters, dried seeds, small miniatures such as a garden trowel etc. It's fun to go through your drawers and play until an idea seems like a good one. You can see how I finished mine in a later photo. To make the hangers for these, I used 4-1/2" of 1/8: ribbon and a 2.5 mm jump ring. Then pressed the two ends together. Once dry and set, I spun the ribbon 180 degrees so that the glued ends were in the center of the wreath, slid the jump ring up to the end, then glued the ribbon together. Once dry and set, I glued the ends back around on itself so the seam was behind the wreath. You can adjust your ribbon to whatever length you need it to hang, just double it and add a little extra for the wreath width and the seam. Here are some of the ones I finished. You can also use lycopodium to make a Christmas wreath. Just apply the glue to your wreath, then wrap the lycopodium clockwise overlapping the narrow tips over the base just a little until it completly covered. Then just add a hanger, a bow and some beads in your favorite Christmas themed colors. You can also add gingerbread cookie men and cookie cutters like I did for last year's Sweet Christmas Cottage. I settled on this one for the front of the cottage, but can easily switch them out seasonally or whenever I get a better idea. Do you see those nine empty pots around the step? Yes, I have yet more flowers to make and plant. And I have to fill the planters in the fences, But I did get a couple key projects done! I turned an old Reallife Miniatures weathervane into one with a teapot rather than the whale it came with. The teapot is a cheap plastic one that must have come with a set of pans or something. It was easy to drill a hole into the bottom so I could slide the pole up into it. I painted it with a copper leafing pen and let it dry overnight. Then I gave it a copper, patina and verdigris gilders paste treatment, followed by a wash of Coffee Bean. It looks like it's scene a few years! Here it is on the cottage. To make the support, I cut a piece of copper tubing to size, then made a strap out of cardstock and painted it with the copper leafing pen. I glued and nailed it into the dormer. Boy that was a delicate operation, but the prayers worked! And now the gate is finished!!! So, in spite of the good progress, the "How To Grow A Cottage Garden" posts will continue on. At least one more, I think. I have more flowers to make, fence planters to plant, fences to install, and two back gutters to finish. Then will it be done? I hope so, because it's getting cold out and I'd love to start working inside! Hi Jodi. Your wreaths look great, as does the rest of the garden. Sounds like there is a ways to go with all those pots though! Hope the week is going well for you! Thanks Shannon! There are more days of flower making ahead, and I'd never have guessed that such a small garden would have taken so many to fill it up! Thanks for your nice comments! It was great to see you pop up in my email, and I hope you've been finding lots of creative time, too! What clever wreath ideas and tutorials! I really liked them all. I don't know how you were able to choose. :-) The teapot weather vane is aged to perfection. And the hinges really make that gate; glad you were able to add them. Thanks Deb! Now that I have put my brain to work on wreath making, I keep having great ideas that I'll hope to remember next time! Maybe I can put some to good use inside the cottage. The weathervane was a fun project to make, and the gate was a lot more cooperative than I thought it would be, which is why I procrastinated on it so long! Thanks Jodi for the wreaths tutorials. I was planning to make some for my flower shop, a project which for all kinds of excuses is still pending. The weathervane is gorgeous! Wonderful work, as usual. Thanks Drora! It was fun to focus on coming up with ideas for them! They can be quite pricey, so I'm happy I could use what I had to make a few different kinds. I hope you feel inspired again to start back on the flower shop - it was such an adorable start, and I am excited to see you finish it! Gracias Rosa Maria! ¡Es sorprendente la cantidad de cosas que se necesitan para llenar un pequeño jardín y para llenar todas esas macetas se necesita más trabajo! Pero si me encanta el look al final, ¡valdrá la pena! Gracias isabel Sigo teniendo el pensamiento falso de que casi he terminado, ¡entonces me doy cuenta de que necesita más! No quiero sentir que no he hecho mi mejor esfuerzo, así que seguiré hasta que me quede sin ideas o espacio. There are just So Many things to love about your wreaths, weather-vane and garden gate which I are Wonderful to see in situ! I think that perhaps my favorite thing is the clever use of the teapot as well as its Superb aging! Each additional tiny detail serves to add to The Continuing Story of your Enchanting Storybook Cottage. Thanks Elizabeth! I would need to make a lot more wreaths before I explored all of the possibilities and was truly in love with one, but for now, they are good. 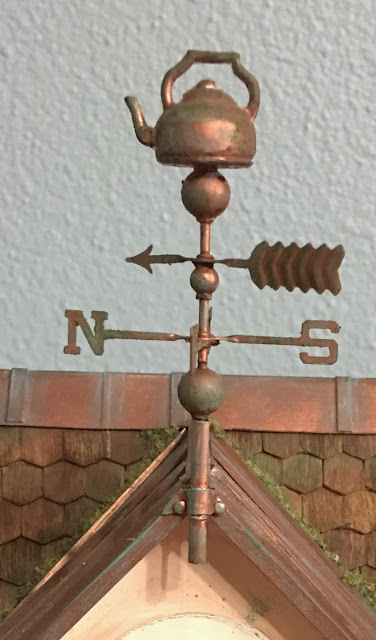 The weathervane was a lot of fun, but the best part was that I actually got the holder to stay put on the dormer and it's really darn sturdy! Victory! And that the gate can move on the hinges! Love your wreath ideas! I'll have to keep them in mind. And your weather vane is wonderful. Oh hinges...I remember hinges... you have my sympathies... those nails... yikes. Thanks Sheila! Glad you like the wreaths and that it gives you a spark for ideas in the future! The weathervane was much more cooperative, and therefore much more fun than I thought it would be. Same with the hinges! Your garden is looking super! I love the pin jig idea, much simpler than the method I use. The wreaths are stunning and cleverly made, and the weather vane is the perfect touch. So much progress, I love reading your posts. Thanks Megan! I'm so glad you like everything! I hope that you are finding some creative time, too, even though you haven't had time for posting with the new writing job! Can't wait to hear about how the babies are doing! Oh Jodi, your wreaths are gorgeous and you are so generous to share your experiments. Thank you. I have done myself some wreaths in the past and although I am happy about them I think you have give more ideas to perfect mine yeahh! the weather vane is so creative an original, I love it. In fact, I love the whole project. This house is already stunning and a piece of art. Every new thing you add makes it even more memorable. Thanks Alex! I am so glad to have given you a little inspiration, though you are so creative already! I'm glad you like the weathervane, too - it was so much fun to make! I don't usually dedicate so much time to a project because I get board or get excited about the next project. But with the cottage I am really trying to see how I do when I am committed to making it all it can be. It is truly a labor of love! Your wreaths are incredible! I just love your steeping technique and the finished product is gorgeous. Your jig for making bows is such a great idea and the bows are perfect. And then to top off this great post, you wow us with that incredible weathervane and awesome gate. Bravo my inspirational friend. I'm happy that you like what I've been up to, and I hope that you have been behind the scenes creating the magic that you do so well, too! Christmas is coming, and your family always gives you the most incredible things for the manor! It's like Christmas for me, getting to see what you got and how it fits into the incredible setting you've created! Wow your wreaths are all gorgeous. Thank you very much for the tutorials. Your weather-vane is so creative. I love your cottage it is awesome and so inspiring. Thanks Maria! I love sharing the many mini things that inspire me and I love when it inspires others, too! Call it a creative wave! Looking forward to the great and fun things you're doing with the toy shop! I did one in my newborn mini days and it was so much fun! Preciosas todas las coronas, muchas gracias por las explicaciones. ¡Gracias Eloisa! Fue divertido jugar con ellos, ¡y es muy satisfactorio hacer que la idea funcione! I found that old weathervane on eBay and made an offer of $5 that was accepted. If you ever happen to see one, grab it! You never know when you might have the perfect project for it! And it's so much fun to make things look old! I can't wait to get inside the cottage, too, though I know some of the things I'd like to make are going to be a challenge to my skills. Me + sewing don't always have a happy ending, and I have so much sewing to do. Yikes! It was a fun exploration into the wreath making, and I am sure you will see some of them pop up here and there from time to time! My mind has not stopped with the ideas, so I feel compelled to have another wreath making session soon! The weathervane was great fun to imagine, and such a relief to get mounted! I did not breathe for a good five minutes while drilling pilot holes for the nails! Whew! And I have already printed several styles of doormat, none of which has been inspirational, so I'll keep thinking and trying. And I have made another 18 flowers in the last couple days for all those pots, with so many more to go. The flower totals in the end will be staggering. But try I must until I love it or can live with it. You know! As much as I am learning and enjoying in this cottage garden, I expect it will be a good long time before I have the heart to take on another any time soon. A nice concrete parking lot for the next build, I think, lol! Oh boy Jody the garden just keeps growing prettier and prettier each week. Who know you could fit so much prettiness in such a tiny spot?! Your weather-vane is just the icing on the cake - I absolutely LOVE it. What a great idea to customise a 'cheapie' and the result is just fabulous. Thanks Anna! I'm glad the wreaths got your brain twirling, and lucky you to have all that vine at the ready! It's been so much fun to explore ideas for this garden, and I am glad that you are enjoying it right along with me! Don't worry about putting the pressure on - I want to see this garden finished so much that the pressure is really just excitement! So much fun and inspiration in this post! It was a big pleasure to follow your different methods of wreath making - and it gave me a good grin to hear that hot water makes grapevine cooperative! And that you mentioned you have a landscaping drawer - great, I'm not alone… although in my case it's a box. *LOL* I really like how your wreaths turned out, each one lovely in its own special way. But I like even more how they highlight your house's look, they really add extra interest to something that had already been so very interesting to look at. As Betsy already said, your entrance looks so beautiful now but seeing your additional pots and imagining them being filled with stunning flowers I understand that there's always a way to add even more beauty to the already beautiful. And speaking of Betsy - hooray for dealing with the hinges, I'm so with you about the tiny nails… but the result is worth the effort (and in my case the curses and all the "what have I done to deserve this"-mourning) The gate looks stunning and it's great being able to move it, this will come in handy for taking lovely pictures. And the weathervane turned out awesome, what a great idea to use this teapot, it's just perfect and the way you've aged it is terrific. Oh, and thanks for the idea with the bow maker, what a helpful little tool. Thanks so much for you wonderful (and funny!) insights, Birgit! I am glad you like the additions to the cottage, and very happy that you may find something useful in my explorations! Your wreaths look amazing! Thanks for the idea and tutorials.The weather-vane is perfect, a piece of art. This garden is a masterpiece. Thank you for sharing the how-to for those lovely wreaths!! I love the weather vane! Great use of the teapot and excellent aging! Deep respect for the hinges! I am still avoiding them ;-). Please don't finish any time soon as your garden series is too good to end! 1. Make sure you've done a run through and KNOW exactly how they are supposed to function. 2. Glue on the hinges to the most stable side FIRST and let them dry completely. 3. Pre-drill the nail holes just shy of the depth of the nails. I used my pilot hole punch. 4. Dip the nail end into glue, push into the pre-drilled hole just until it resists, make sure it is straight and then push the rest of the way in with a metal tool until it is seated flush. I used the flat tipped end of my pliers. Go slow. 5. Wipe away any oozed glue. 6. IMPORTANT! Do not attempt to move until all of the nails have been installed in this manner and it has had at least an hour to let the glue set. 7. Line up with the corresponding piece and install the hinges as in steps 2 thru 6. This worked well for me this time, but I was in a calm and patient frame of mind, which I know is imperative for fiddly tasks like this. Thank you!! I am pinning these instructions!! Ha! I winced at the picture of the shiny metal teapot glued on top of the brass weather vane, but then gasped in delight at the next picture, with its paint and patina. Very well done! The wreaths all turned out beautifully. I particularly like the one with the asters. Ha ha! Thanks Keli! I had to go back and look at the photo, and I don't blame you!!! I guess things can look Really Bad before they get better! Such great ideas for wreaths Jodi! They are all so adorably cute!. The grape vine was a great idea, I've always loved twiggy wreaths, in fact my real life Christmas one has a twiggy background. :) But who would have thought of using foam cut out! Brilliant! I must try some of these myself! I'll add it to the list of my 9,999 projects in line to start.. lol. Thanks Sam! I had a twiggy wreath once that followed me to a number of residences over the years and I loved it! It did not match the Eggplant door when we bought this house, and I always intended to make a new one, but just now realized that I never did! I guess I better take advantage of the upcoming Black Friday sales at the craft store and make a real life one finally! So many inspired ideas, so little time. I feel ya there! I have a folder on my PC with photos of every idea I've collected for the cottage. Each time I do one, I move it out of the folder. Hardly a dent, so I've had to pick and choose. But it's such great fun to see it getting closer to "finished", and I really love all the great crafts I've been able to explore wit it so far! The facade still delights me every time I look at it, and that feeling is wonderful! But it seems like it will be Spring/Summer a bit longer in Jodi's world :) Happy flower making, your patience is beyond incredible. Thanks Kristine! I'm happy that you got some ideas and I hope you get to make lots of gifts and bows! The wreath making ideas haven't stopped since I made the first few, so I imagine I'll have to put a few in the cottage. I had so much fun with the Sweet Christmas Cottage, and I am so happy that by the end of next week I'll have an excuse to move it into the family room and put the lights on again! Glad you like it, too! Yes - there are no changing seasons in Jodi's world. Each house gets to choose it's own, and this cottage is in constant Bloom year round! Thanks Brae! I'm so glad the weathervane idea worked out, and I'm happy you loved the wreaths! Next time I do hinges, I'll be a little more confident - if I can remember how I did these!!! OMG! The detail! That weathervane! Jodi, you are a master at your craft! So much to be inspired by! Thank you for sharing! Thank you for sharing in the garden with me, Teresa!